Is food chemical sensitivity disappearing into history? If you think your food chemical symptoms seem to be less well understood or accepted than they were in the past, you are probably right! Many health professionals feel that if food sensitivity has not been clearly proved by now it deserves to disappear into history. It should not disappear! These two conflicting ideas: that symptoms one group know are related to their diet, and scientists who want the symptoms and diet to be neat and easily researched, need to be resolved. Forty years ago medical consultants were prepared to do research, but over time less work was published as the variety of symptoms increased, and research could not cover the complexity. The increase in use of a wider variety of additives, herbs and spices has occurred only over the last fifty years. Many dietitians are letting the idea that some may react to foods fade into history. But clinical research has been done and reported. 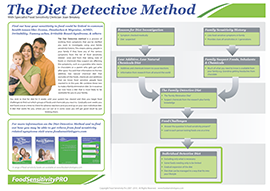 And some dietitians are listening to their patients’ distress and supporting diet investigation at an individual level. For more information see the full presentation on my site (download here). It includes references to important published articles that have influenced thinking, not always constructively. Food chemical sensitivity is a multi-system disorder so it does not cluster under one medical specialty. And each specialist sees only a small number of food sensitive patients, so each is unlikely to be believed. I really do not think food sensitivity is ‘disappearing’….if anything, I feel it is becoming more common and being passed off as other health issues. Yes, Pamela, thank you for supporting people who know their symptoms are worse after suspect foods but who are not believed, and others imply there are other health issues! I want everyone who is reading this, if they suspect food sensitivity, to be assertive with everyone they are in contact with, and their doctor, to keep the awareness increasing. Dietitians can help with this by becoming well informed. All can recommend others read the presentation, and the links, and references, so the role of food in symptoms is increased. Thanks Pamela!